Let’s look back at the legacy of Star Wars Rebels. March 5 marks one year since the end of Star Wars Rebels. It’s the anniversary of us seeing one story of Ezra Bridger end, while another one began. You may have even been alerted to this because of the popular #RebelsRemembered hashtag trending on Twitter. In trying to figure out something to post to remember Rebels, I realized it was too big of a task. I have too many fond memories, not just of the show, but of our coverage of it. Talking to executive producer Dave Filoni, debuting clips, sparking debates—it was all so much fun. So here are just some of our best Star Wars Rebels memories, in blog form. It all began in 2013 with the news that Star Wars Rebels was coming. And it continued through 2014 with this review of the pilot. As early as season one, we got to see some iconic Star Wars mythology in Rebels. We discussed the first season finale and how it changed everything. Rebels revealed the origins of the B-Wing. We were all excited to see Princess Leia on the show. A moment in the second season of Rebels may not have seemed major at the time—but, fast forward a few years, and these characters came back for the finale. We said that the Jedi at the center of Rebels probably couldn’t all survive, and we were right. You saw (and loved) the season two finale, which featured Darth Vader, Darth Maul, and others. And thankfully, we got Dave Filoni on the phone to talk all about it. A massive, massive moment: Grand Admiral Thrawn was officially revealed to be added to the Star Wars canon, via Rebels. Still reeling over the reveal that Thrawn was coming, we spoke to Filoni about that and more from Star Wars Celebration in London. One of Rebels’ most shocking moments happened when Ezra and Maul opened the holocrons, so we dove into that. From The Clone Wars to Rogue One and then to Rebels, Saw Gerrera returned. We broke down how, exactly, ships from Rebels ended up in Rogue One. One of the things Rebels did best was bring in iconic legacy characters, like Mon Mothma, who had a few huge moments on the show, such as this one. This is probably, of all of these articles, our crowning achievement. An interview with Filoni to discuss arguably the most important moment in all of Rebels: the showdown between Darth Maul and Obi-Wan Kenobi. We broke down the season three finale. Filoni confirmed there was a subtle Thrawn reference in Rogue One. As we learned more about Solo: A Star Wars Story, we knew Rebels would be in roughly the same time period. But Filoni killed any question of a crossover. 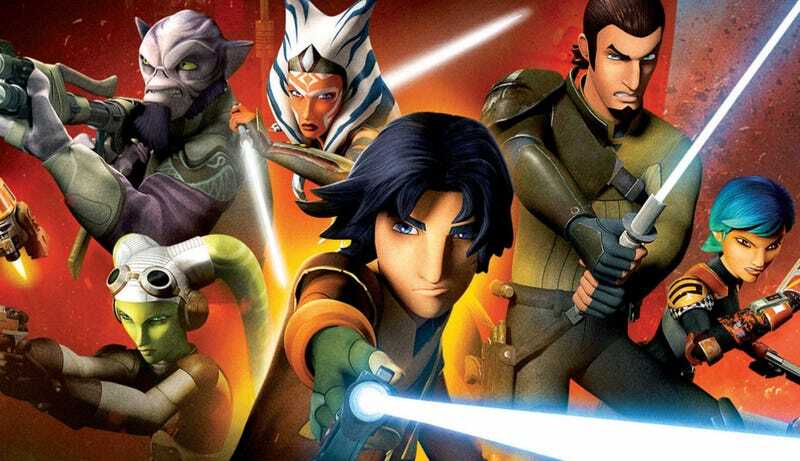 Just as the final season was set to debut, we spoke to Filoni again about where the show was and how it fit into the overall franchise. A internet short revealed that Hera would survive through the end of Rebels and beyond, which Filoni was OK with. When the trailer for the final season was released, we had Filoni answer as many questions about it as he could. Which, as usual, is never that many. One of the saddest days was when Kanan Jarrus was killed. Here’s the blog about it (note that to keep that spoiler out of the headline, I called it a “big mystery” because “Where the hell is Kanan during the movies?” was always a big question to me). Rebels introduced the Star Wars version of time travel. Kind of. Like you, I was stunned by the series finale. We had some answers to your biggest burning questions about that epic finale. Filoni told us that the mystery of where Ahsoka has been, and where she’s going, would remain that way for a while. And a year later, we’re still nowhere closer to finding out where she’s been and where she and Sabine are going. And that just about brings us back to today. In the year since Rebels ended, Star Wars animation and Filoni have both moved on—animation to Resistance, Filoni to The Mandalorian. But one day we’ll find out what happened to Ezra and Thrawn and how Ahsoka and Sabine went after them. Until then though, we’ll just have to remember how Rebels was the best thing to happen to Star Wars in a long, long time.